Steel platform bed with supports. Available in Twin Extra Long or Full Size. Strong Construction. Easy to assemble. Available in Black or Silver. Full Size: 79 In. x 55.5 In. x 13.8 In. Iron Style Metal Bed. Comes with link spring. No Box Spring is needed. Easy to assemble. Strong Construction. Available in Twin, Full and Queen Size. 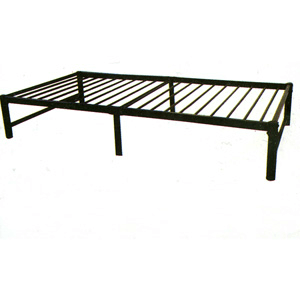 Iron Style Metal Bed. Comes with Link Spring. No Box Spring necessary. Easy to assemble. Strong Construction. Available in Twin, Full and Queen Size.